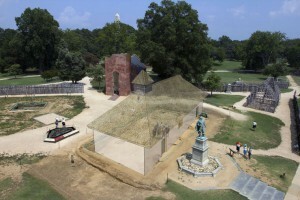 The announcement Tuesday of the (probable) identification of the remains of four men buried under the chancel of the first parish church at Jamestowne, Virginia – first discovered in 2010 and unearthed in 2013 – has now made the front page of The Wall Street Journal and appeared in other leading news outlets. While not the first Englishmen to die in the nascent American colony, they were nearly so, probably interred in Virginia soil in 1608 and 1610, more than a decade before the Mayflower arrived on American shores; these men were certainly among the colony’s founders. The Reverend Robert Hunt, whose identity seems the most certain, was the first pastor of the Anglican parish at Jamestowne. Burial in the chancel, or elsewhere in the parish church, was and remains customary for founding pastors, although this burial seems as likely because his death occurred so far from his home in England. Assigned to Virginia from the parish of Heathfield in Sussex in 1606, he arrived with the first settlers in 1607, and his pastoral service extended through early 1608. His will was probated in England in the summer of 1608. Hunt left two children, a son and a daughter, in England. Captain Gabriel Archer was also a major figure in the earliest years at Jamestowne. Because of the presence of a reliquary, identifying the remains as those of a probable Catholic (or crypto-Catholic ), his prominent role as a chronicler of the early colony, service as secretary and councilor, and highborn status at home in Essex, his identification is also nearly certain. Archer died before the end of the “Starving Time” between 1609 and the summer of 1610. While he did not have lineal descendants, near kinsmen did, and his brother, John Archer, inherited his stockholdings in the Virginia Company. 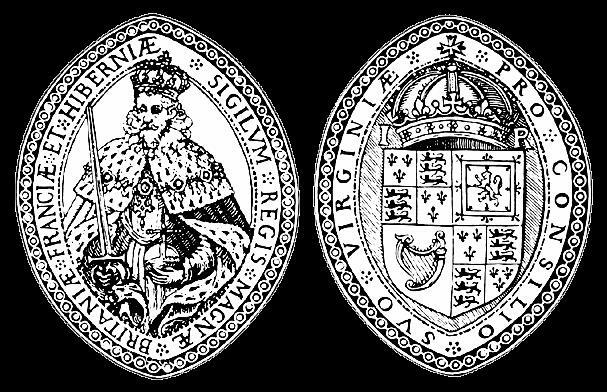 Sir Ferdinando Wainman (Wenman, Weyman) was a stockholder in the Virginia Company who arrived with the governor, Thomas West, 3rd Baron De La Warr (or Lord Delaware), in June 1610. While most articles say he was a relative of Lord De La Warr, he was specifically a first cousin, the son of Jane West, youngest child of William West, 1st Lord De La Warr. He was, like Archer, a member of the Virginia Council, and he rendered other service to the colony. He died later in 1610, and George Percy (son of the Earl of Northumberland), Lord De La Warr’s predecessor and successor as governor, lamented the passing of this “honest and valiant gentleman.” The Records of the Virginia Company also demonstrate that a later patent was awarded to Sir Thomas Weyman. Captain William West may have been a close relative of the 3rd Lord De La Warr, though given his probable age it does not seem likely he was the younger brother of the 2nd Lord named William West. Many Americans and Britons alike can trace their ancestry to this family. While the 3rd Lord De La Warr left many descendants in Britain, only his younger brother John West left traceable descendants in Virginia, the author of this article among them. A potential path toward definitively proving the identification of William West would be to test recoverable DNA against the y-DNA of a patrilineal kinsman. In any case, the William West who was probably buried under the chancel was killed in combat with Indians at the Falls of the James in 1610. The reliquary is of particular interest as the earliest sacred object of its type recovered in Virginia. It is uncertain what degree of relic it contains, but a member of the English gentry at the dawn of the seventeenth century could have possessed something very remarkable. In the late 1500s, Pope Gregory XIII declared 63 English and Welsh martyrs venerable. Many of them were later beatified and ultimately canonized by Popes Pius XI and Paul VI. It is not unreasonable to suggest that the reliquary might well contain a remnant of one of these saints who could even have been a close relative of Captain Archer. Certainly, the Calverts, Lords Baltimore, the Howards, Lords Arundel, the Gerards, and others in early Maryland had near relatives among the Martyrs of England and Wales. Perhaps genealogical enquiries into Archer’s ancestry and kin will make the meaning of the “M” on the reliquary apparent. Like the West family of Virginia, the Pelham family of New England and New York descends from Lady Mary Boleyn, grandmother of Anne Knollys, wife of the 2nd Baron De La Warr. Does the following link for Captain William West have any validity? I too am descended from Mary Boleyn. Doug Richardson’s set is an invaluable work and the West (and Wainman/Wenman/Weyman) relationships included therein are correct. You therefore comprehend the problem with the identification of Captain William West I suggest in my article. Historic Jamestowne and the labs it worked with provide that these remains belonged to a man in his 20s, “the youngest” of the interments they call him (see, for example, this “Captain William West” page [ http://historicjamestowne.org/archaeology/chancel-burials/founders/william-west/ ]. Therefore, the interred person was either not Captain William West, if indeed he was the William West in the reference you cite, as that man would have been 50 to 55 years of age in 1610, or else that William West was not the man who came to Virginia with Lord De La Warr. It seems likely that if the remains were William West who died in 1610 at all, then they were a different, same-named kinsman of Lord De La Warr. The name De La Warr is as well found in the State of Maine through the descendants of Edward and France Small (Smalley). Again the question is one of religiosity …. unlike the Puritans of the Mass. 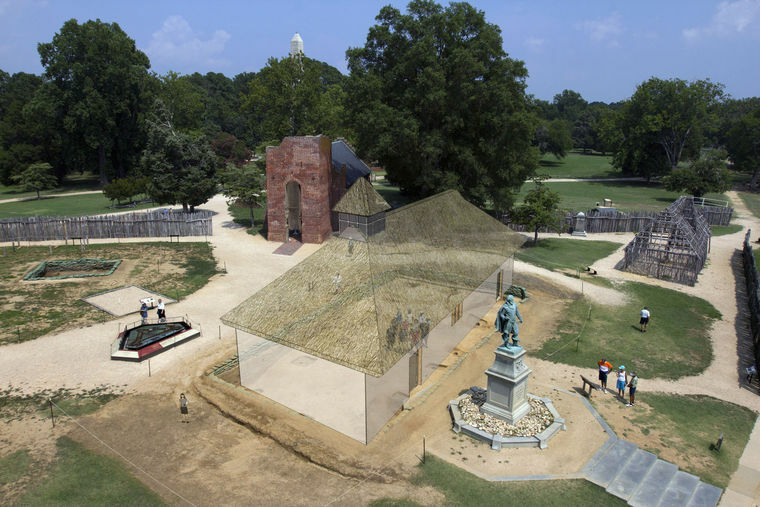 Bay Colony – the earliest colonial settlers of the Jamestown Colony as well as the Popham Colony could be classified as largely High Church West Englishmen …. as such these churchmen on the cusp of both Catholicism and Anglicanism could have very well bought Catholic relics in to the new world. There should be nothing surprising about the affirmation as shown by this newest discovery ! Mr. Lee, You mention being a descendant of the Delaware-West lineage. Are you interested in corresponding? I can send you a chart and a summary of my findings and YDNA results. I am a double descendant of John West (ca. 1735-1818) of King William Co. and Campbell Co., VA. Because of Dennis West’s project which you may have seen, I had YDNA tests done on a male-line descendant of my John West 3 years ago, before I knew 2 other descendants had already done the test. They all match one another and a descendant of William West of King William, also born ca. 1735, who married Letitia Martin, and William is listed in the traditional genealogies of the Delaware-West family, apparently one of the few legitimate descendants of Gov. 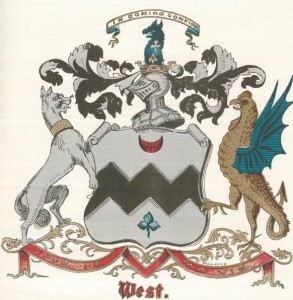 John West in his generation carrying the West name. But none of these match Lord Sackville-West, the current holder of the Delaware title in England, descended from Gov. John West’s brother Thomas, Lord Delaware. So far their only matches are to those with the Leigh or Lee surnames, no other Wests, but the genetic distance to those Leighs-Lees is greater than they are to each other. It’s possible there was a nonpaternity event in our lineage, in that of Lord Delaware, or both. I can email you a report and a chart on this if you let me know your email address. Although William West is listed as a son of Col. Francis West, that has been questioned, and I am convinced he and my ancestor John West were second cousins and that my ancestor was one of the sons of Col. John West by his relationship with the Indian Princess Cockacoeske, whereas Francis and William were descended from his white wife, Unity Croshaw. At any rate, I have not found anyone working on the Wests of King William and am trying to solve the mystery of my ancestor’s origins and the YDNA mismatch. Rev. Robert Hunt was my 12th great uncle. I would like to present a program about him for Colonial Dames of the 17th Century. I am about to do a set of membership papers on Rev. Hunt;s nephew Ambrose Cobb. I am looking for video or pictures that would be of interest to my audience. Do you know of something that would be good for visuals?